Pablo Diego José Francisco de Paula Juan Nepomuceno María de los Remedios Crispin Crispiniano Santísima Trinidad was born in Malaga, Spain. He is considered the most celebrated artist of the twentieth century for his virtuosity, inventiveness, and expressive power, which were evident long before he reached the age of 20. Picasso demonstrated extraordinary artistic talent at a young age, painting in a naturalistic manner through his childhood and adolescence while under his father’s supervision. Picasso’s first dated oils were mainly portraits, painted in 1894-1895. In 1897 his father and wealthy uncle pooled their financial resources to send him to Madrid so he could study at the Academia Real de San Fernando. In the spring of 1898 Picasso contracted scarlet fever and his sister Lola was sent to care for him. He eventually went to stay with a friend on the border of Catalonia and Aragon so he could recuperate fully. That was the end of his formal studies. Early on he was widely known for his deeply personal so-called Blue Period and the Rose Period that followed from 1901 into 1906. Beyond being a painter, he was a sculptor, printmaker, ceramicist, and poet and with George Braque, the co-creator of Cubism. He mastered every medium he explored. When he turned his attention to printmaking, he loved working on copperplates and created a prodigious number of etchings. 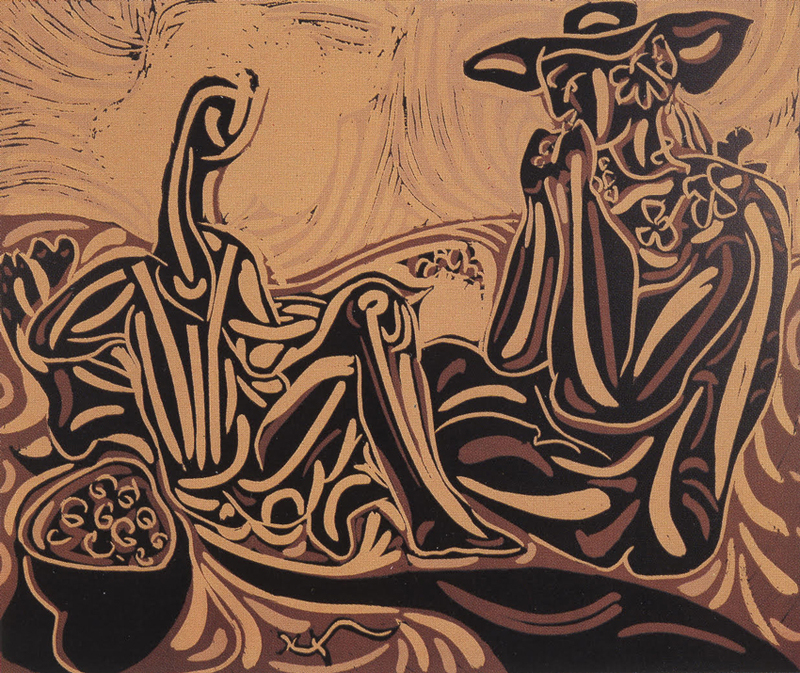 He experimented with woodcuts but found them slow going and strenuous. He went on to make lithographs and linocuts but out of a total output of more than 2000 prints, he is known to have made only about 150 linocuts, consequently very prized by collectors. In her book Picasso: The Engraver, Brigette Baer tells us: “More than his painting or drawing, printmaking gives us the feeling that for Picasso it was a kind of day-by-day private diary, telling us about his deepest emotions, his brooding on desire, suffering, separation, fear of old age and death.” Picasso declared, “When I was a child, my mother said to me, ‘If you become a soldier you’ll be a general. If you become a monk you’ll end up as the Pope.’ Instead, I became a painter and wound up as Picasso.” It is a great privilege to live with any artwork that he touched.